Wedged tightly between my old NES Game Atlas and a small book entitled ‘How To Win at Pac-Man’, in the dark, forgotten lower catacombs of my bookshelf, was this fully illustrated, step-by-step guide on how to solve a Rubik’s Cube, aptly called ‘The Solution’. 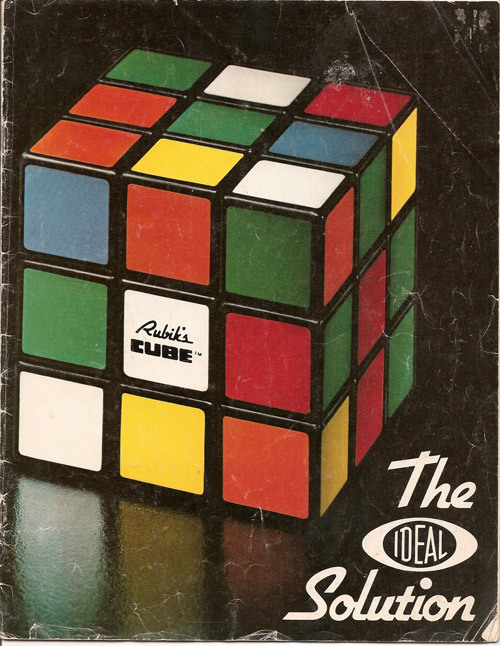 Published by Ideal, the (now defunct) toy company that originally manufactured the Rubik’s Cube, it is possibly the only “official” guide ever published. It starts with a lot of words (which you can skip) and then tells you to get the four blue corners in place around the blue center piece. Apparently from that point there is only one possible path to completion, and this guild will hold your hand as you walk down it. It provided illustrations and fancy arrows showing you exactly what to turn where. A dozen or so pages later and you will be able to feign genius and impress your friends with your newly discovered secret talent. Surprisingly, most people I show this book to never knew it existed. Today however, it serves little practical purpose since several video guides are readily available on YouTube. GI Joe figures blew away most other action figures of the time with their swivel arm action, kung-fu grip, and myriad other points of articulation, however they utterly failed in one feature absolutely key in any pretend battle: the ability to stay together. While the characters in other worlds could be hit by heavy injection-molded artillery, thrown several yards, run over, drowned and eaten by a Grue and STILL manage to get to their escape pod and pilot a getaway through an asteroid field, all it took was one misadventure at the chiropractor for GI Joe and it was game over. This held equally true for members of Cobra. Laird James McCullen Destro XXIV was one of several who met such an untimely, unfortunate end. The cause could be traced directly to his large intestine, or rather to the black rubber band that held the two halves of all GI Joe figures together. This band was very prone to breaking either due to age or excessive twisting, and once broken could not be easily repaired. 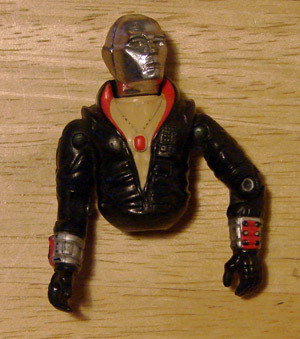 Thus most broken figures stayed broken, but Destro being the lovable guy that he is I just couldn’t bring myself to throw him out. This top half has been kicking around in a cupboard full of junk and tools for who knows how long. I’m sure his legs are around here somewhere. As with most children of my era, Star Wars toys made up a disproportionately large percentage of my personal toy empire, second only to maybe Lego. At its peak I had well over a hundred figures, at least a dozen major vehicles, and countless other accessories. Although I never threw any of these treasured possessions out, their numbers have dwindled from year to year…a mysterious phenomenon which itself has never been given the sort of serious attention and study by the scientific community it deserves, since I feel that I am not the only one to have experienced this, but I digress. 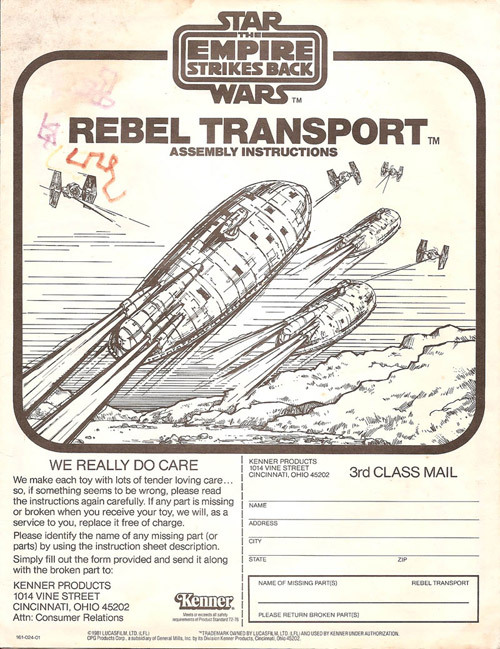 Of the few that remain none are more peculiar than my Rebel Transport Assembly Instructions. This six page, 8.5″ x 11″ tri-fold instruction manual explains, mostly via illustration, all the important things one needs to know before embarking on a journey across the galaxy or, as alluded to on the cover of the manual, engaging in a dogfight with TIE Fighters. Among the things included are Floor and Turret Assembly (for adults only), how easy it will be for any prisoners you capture to escape, and how to put a gas mask on Princess Leia. We are also reassured on page one how much the people at Kenner (now part of Hasbro) “Really Do Care” and to show how much they care they include a form which you can cut out and mail to them (third class?) for replacement of broken or missing parts. This used to work, I know because I did it once, but I’m not sure I’d try it today.